Today I want to share with you a recipe that was for me just opening. And while I heard about this dish many times, I had a chance to try out recently. So, your attention - polenta with ricotta, spinach and gorgonzola! No doubt many of you have heard about the polenta (corn grits, cooked in a special way) - a dish of Italian cuisine, no less popular than pasta or pizza, especially in the northern part of Italy. Initially, the polenta was a food of the poor. And it is nothing surprising: the rump, thickly brewed in the water, eating a porridge or baked on hot stones, making a kind of semblance of bread, tortillas. No frills, but a hearty and nutritious, and what else is needed. I must say that is not always the corn was the main cereal for making polenta. Prior to its wide dissemination in Italy (XV-XVI centuries.) Dish prepared from millet, barley and buckwheat. Today polenta - delicious meal, with hundreds of choices of cooking and serving! if you love Italian cuisine, Most original flavor combinations, or simply want to diversify your diet, be sure to try this simple and at the same time, an unusual treat. Personally, for my taste, with polenta ricotta, Shpnatom and gorgonzola - a fantastic dish that is not inferior to, say, a paste or a risotto and a decent feed at the best restaurants! *If the ricotta is hard to find in your stores, use the normal fat cottage cheese for at least 9%. Corn grits add water (up to 2 times greater than the number of grains) and cook over low heat, stirring constantly, 2-4 minutes; add salt to taste. Also, if desired, it can be added in Italian herbs and spices for flavor. Smooth a thin layer spread half of the resulting porridge on the bottom of the form (if necessary grease the form of oil). Spinach pre-defrost (if using frozen, like me), squeeze the excess liquid. Fresh cut and simmered in a skillet with a little oil (or blanch: put it in boiling water for a few minutes, then rinse with cold). 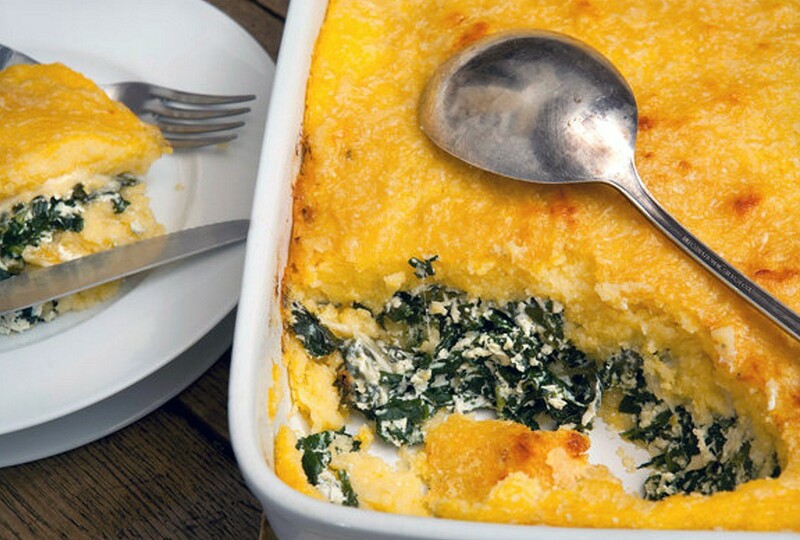 Spinach mixed with ricotta and spread evenly over the corn grits layer. Slices crumble Gorgonzola, sprinkle with spices and herbs (optional). The rest of the porridge evenly over the ricotta with spinach. Put the form in a preheated 180 degree oven and bake 20-25 minutes. For a couple of minutes until cooked sprinkle recommend polenta cheese (any). When submitting decorate your favorite herbs or adored me pesto. Delicious, hearty, simple and elegant!